The Blaeu publishing house in Amsterdam is remembered today mainly for its world atlas, the Atlas major. 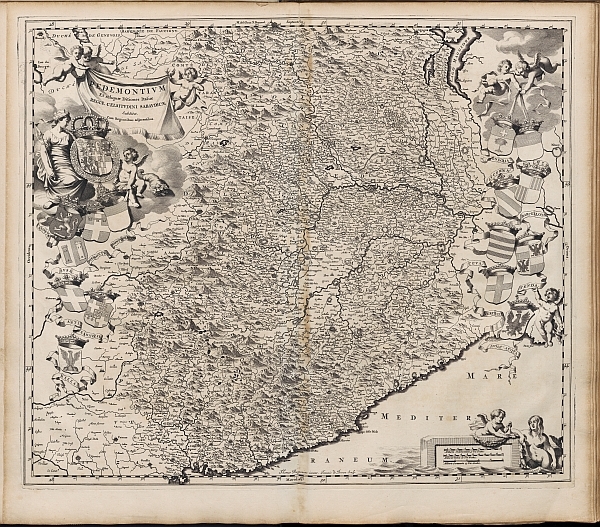 This atlas was published in 1662 by Joan Blaeu, son of the firm’s founder Willem Jansz. Blaeu. Not so commonly known, however, is the fact that Joan Blaeu in that same period started planning the creation of a second mega atlas, dedicated to the cities and monuments of Italy: the Theatrum civitatum et admirandorum Italiæ. This project had its origin in Joan’s own love for Italy, where he had travelled extensively, combined with a more general interest in the country in the seventeenth century. The atlas of Italy has been called the most beautiful, but also least known of Joan Blaeu’s works. The collecting of material for these books must have kept him busy for years. Unlike the town atlases of the Northern and Southern Netherlands, the volumes of the Theatrum Italiæ consist not only of maps and profiles, but also of engravings after architectural drawings of towns and cities, palazzi, churches, monasteries and ancient monuments. Three volumes of the Theatrum Italiæ series were published by Joan Blaeu in 1663. They treat the Vatican and the Papal State, the classical monuments of Rome, Naples and Sicily. The remaining two volumes were brought out by his heirs in 1682: these are dedicated to Piedmont and Savoy. Letters written by Pieter Blaeu on behalf of his father Joan, however, have revealed that extensive preparations for these last two volumes were carried out while Joan was still alive. The Blaeus wanted to keep their promise to Duke Charles Emanuel II of Savoy and Piedmont that they would map his dominions, but due to a series of misfortunes the Piedmont and Savoy atlas, entitled Theatrvm statvvm regiæ celsitvdinis Sabavdiæ dvcis would not be published earlier than 1682. Another planned volume, on the Grand Duchy of Tuscany, would never be published at all. The map which opens the first volume, following directly after the description of the Piedmont region, clearly shows the meticulous approach adopted by the Blaeus: attention was dedicated to the Lago Maggiore and to cities such as Asti, Vercelli and Novara, but countless smaller towns were also included on the detailed map. Post by Gloria Moorman, Leiden Book and Digital Media Studies graduate and Elsevier/Johan de Witt Thesis Prize laureate with her master thesis Discovering Rome through Joan Blaeu's Admiranda Urbis Romae.